Petrol powered rotary lawn mower with plastic chassis. Working width 41 cm. Suitable for areas of up to 700 m2. With primer for better cold starting. petrol lawn mower without self propelled system. 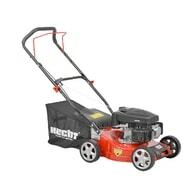 HECHT OHV engine, working width - 41 cm, grass collector - 50 l, weight - 23,5 kg. Petrol lawn mower equipped with original engine HECHT OHV. 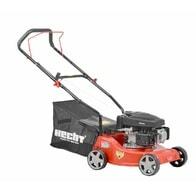 Working width – 43 cm, weight – 20,5 kg, grass collector – 45 l.
Self-propelled petrol powered rotary lawn mower with 4-stroke engine with displacement of 99 cm3. Working width 41 cm. Suitable for areas of up to 800 m2. Benzínová sekačka HECHT 541 SX s pojezdem. Motor Hecht OHV, výkon 3,5 HP, záběr 40,6 cm, koš 40 l. Hmotnost 27 kg. 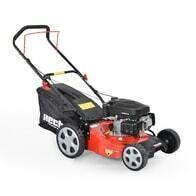 petrol lawn mower without self propelled system, equipped with HECHT OHV engine. 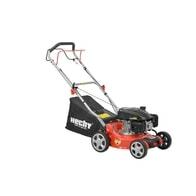 Power ouput – 3,4 HP, working width – 46 cm, grass collector – 65 l, weight – 24,5 kg. Metal chassis, ball bearings. 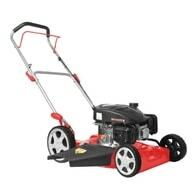 petrol lawn mower with self propelled system is equipped with Briggs&Stratton engine, Series 450E. Self-propelled petrol powered rotary lawn mower with 4-stroke engine with displacement of 98.5 cm3. Working width 43 cm. Self propelled petrol powered rotary lawn mower with steel chassis, equipped with ball bearings. Powered by HECHT OHV engine with displacement of 135 cm3. Working width 46 cm. Mulching kit included, alternative side ejection. Self-propelled petrol powered rotary lawn mower with 4-stroke engine with displacement of 98.5 cm3. Working width 43 cm. Electric starter. Self propelled petrol powered rotary lawn mower with steel chassis, equipped with ball bearings. Powered by HECHT 4 stroke OHV engine. Working width 46 cm. Suitable for areas of up to 1200 m2. Central adjustment of cutting height. Mulching kit included, alternative side ejection. 4 speed. Patented wheels design. Self propelled petrol powered rotary lawn mower with steel chassis, equipped with ball bearings. Powered by 4 stroke OHV engine with displacement of 173 cm3. Working width 51 cm. Suitable for areas of up to 1600 m2. Central adjustment of cutting height. Mulching kit included, alternative side ejection.